A three-year-old child’s skull discovered in South Africa in 1924 presented an odd puzzle to scientists. It was about 2.8m years old (so belonged to a ‘pre-Homo sapiens’ species called Australopithecus africanus) and had some strange puncture marks on its face, just below the eye sockets. What had made these holes, they wondered, and was it the reason why the child had died? At first, it was assumed that they’d been made by the fangs of some prehistoric big cat, but the truth turned out to be rather more extraordinary. The killer of the so-called Taung Child had been an eagle. Yes, an eagle. Even today, there are eagles that prey on treetop monkeys – the monkey-eating eagle of the Philippines is one, as is the harpy eagle of Central and South America, though it is also partial to sloths (they’re easier to catch). I was mulling this over – well, that if an ancient bird of prey could have carried off one of our ancestor’s children, then presumably a modern one might be able to get away with one of mine – as our not-yet-three-old, Mungo, ran gleefully towards the biggest flying assassin he’d ever encountered. It was a Steller’s sea eagle, a massive beast with talons and a beak like a set of Kitchen Devils. Admittedly, it was still juvenile and captive, but it also probably stood some 70-80cm from head to toe and weighed up to 8kg. Mungo might just have had the edge in size, but in terms of armoury and fighting ability, I’d have backed the bird every time. It’s also true (the name gives it away) that a Steller’s sea eagle is more likely to be slicing up cod for sushi than decapitating primates, but still – this was one case where intervening felt like the right thing to do. A young Steller’s sea eagle probably prefers sushi to little boys, but you can never be sure. Mungo clearly wasn’t a bit concerned. I do wonder what he thought he was going to do when he reached the bird, but luckily I was able to intercept before any encounter took place. 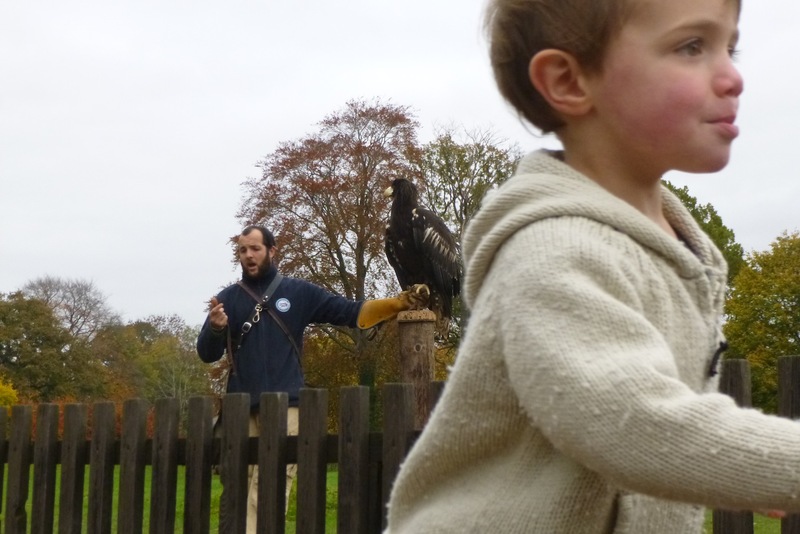 Besides, I suspect the people who run and work at the International Centre for Birds of Prey in Newent would have been less than delighted to see a small, robust boy grapple their prized flying exhibit to the ground, whoever the odds favoured. It might have ruffled a few feathers. Mungo had already caused a bit of a stir. We’d turned up at 11-ish on one of the last Fridays in November to see the flying demonstration. I’m not usually too keen on captive raptors (as birds of prey are technically called by zoologists), but I thought Mungo would enjoy it. And – crucially – there’s a bald eagle in Julia Donaldson’s The Snail and the Whale, so it was another tick in our gruffalo quest. Try as hard as we might, there weren’t going to be too many wild eagle sightings, even in deepest, darkest Gloucestershire. 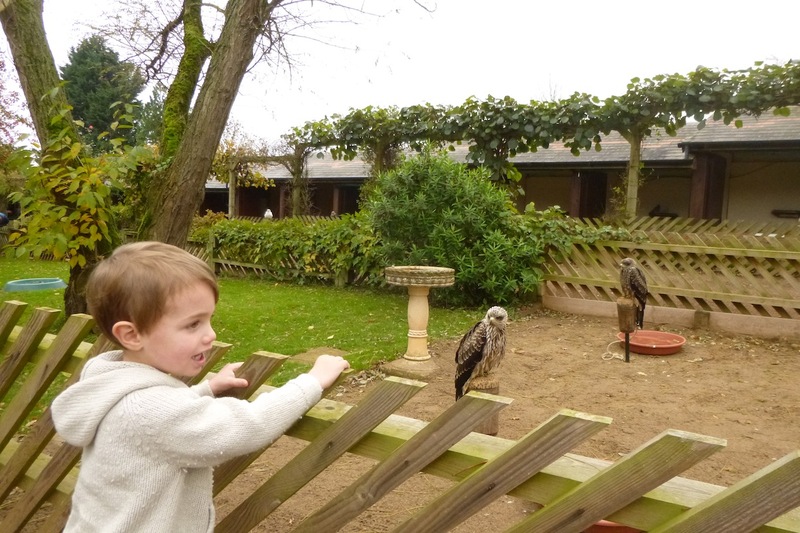 Mungo and two of the residents of the International Centre for Birds of Prey in Newent in Gloucestershire. The first bird to be put through its paces was a saker falcon. These are lean, mean flying machines, and the demonstrator – the lady, in fact, who runs the centre – showed us its skills by swinging a lure around her head at great speed. The falcon flew off towards a line of trees about 60 feet or so away, then flew back at considerably greater pace, coming down low like an enemy fighter plane avoiding the radar and then speeding past. It was a thrilling sight, and Mungo and another little lad who was there with his granny showed their appreciation by squealing in delight. The falcon came round for another go, and the boys squealed even louder. This was great, I thought – such enthusiasm. The only problem was that it wasn’t going down too well with our demonstrator, who was trying to give a simultaneous lecture through a PA system. 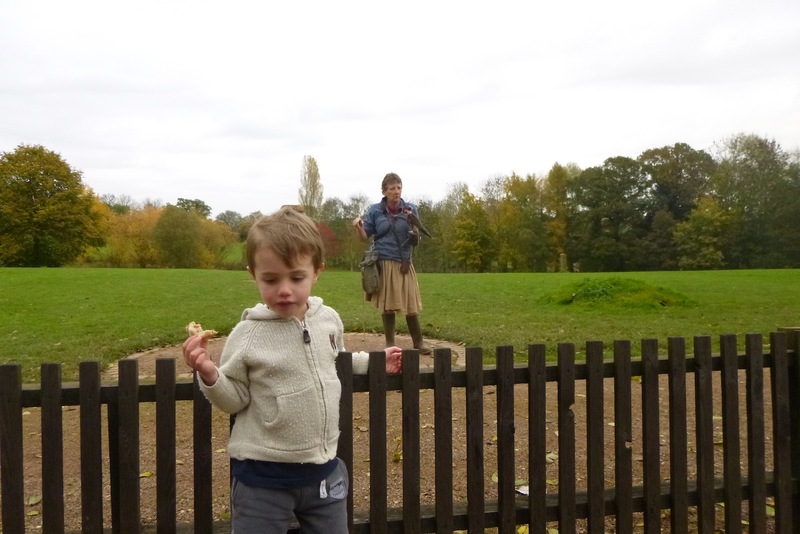 There was, no doubt, some fascinating stuff about the saker falcon’s ability to dive-bomb its prey at 200mph, but the audience – consisting of three other adults besides myself and the other boy’s gran – was finding it rather difficult to hear. “If people are going to shout and scream, then I won’t bother,” she said sternly, which made me wonder if her comment about these birds hunting prey rather bigger than themselves was meant to be taken literally. Still, I bet no one had ever shown such vocal enjoyment of falconry before. Mungo was eventually calmed down with a peanut butter sandwich. Who would win a fight between a small boy and a very large eagle? Answers on a postcard, please. Later the same day, Mungo tried to find a way into the Andean condors’ enclosure, but luckily for them, it was well sealed. 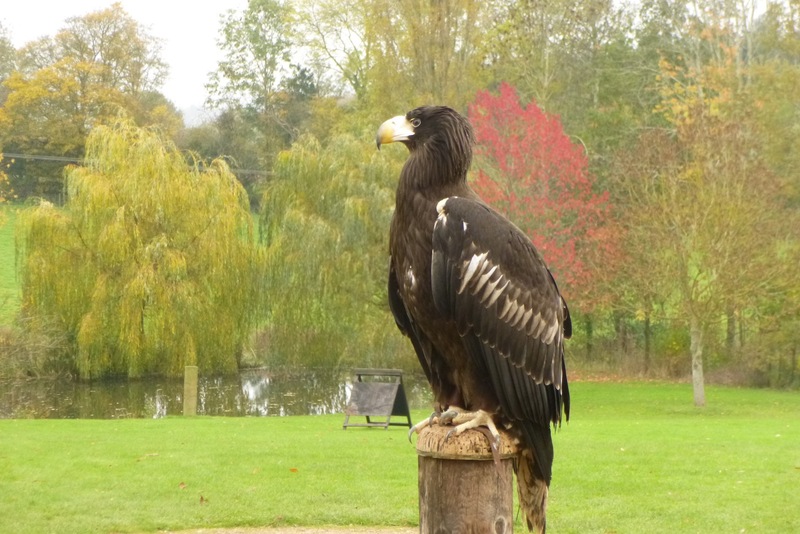 All in all – despite my doubts about captive birds of prey – the visit had been a success, though I think I’ll be scanning the skies of Scotland with a touch of nervousness when we go there next year in search of eagles.